Follow the recipe below to make cake layers. Allow cake to cool completely. 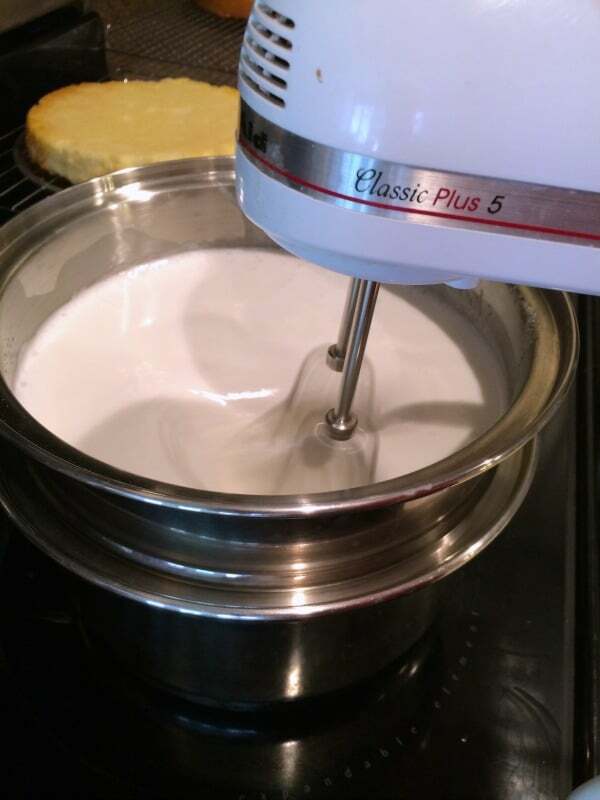 Make 7 Frosting and Sugar Syrup. Begin to assemble layers by placing a dollop of frosting in the middle of the cake plate to prevent cake from shifting. Cut strips of wax paper and place around outside of cake plate so that the wax paper will be under the very edge of the bottom layer of cake. 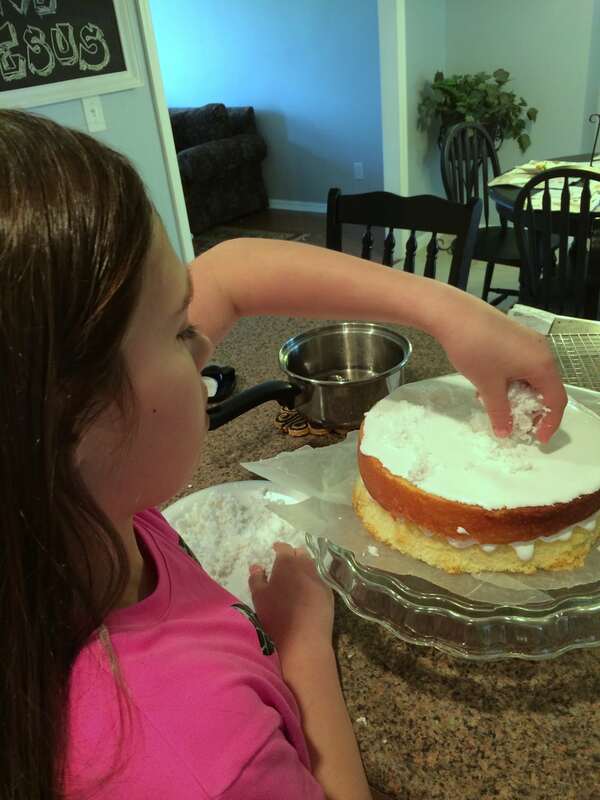 By doing this you will keep your cake plate nice and clean. Only place the wax paper around the very edge of the cake because as you add layers and frosting the cake gets heavy and it will be hard to remove if it’s too far under the cake. Place layer number one on cake plate, then spoon just enough sugar syrup mixture over cake to cover the top layer (this makes it really moist). You don’t want it dripping off, just enough to soak in. After the sugar syrup, frost layer with 7 minute frosting. Add coconut on top of 7 minute frosting. If you’ve never used frozen coconut you will be shocked at how moist and delicious it makes your cake. Add layer number two and repeat process. When you get to the last layer you’ll cover the entire cake with 7 minute frosting and then add coconut generously all over. When making the 7 minute icing make sure the boiling water from the pan doesn’t touch the bottom of the top pan, otherwise your frosting will be grainy. Wax paper around the edges of the cake plate will help keep your cake plate clean while you are assembling and frosting. Use generous amounts of frosting. 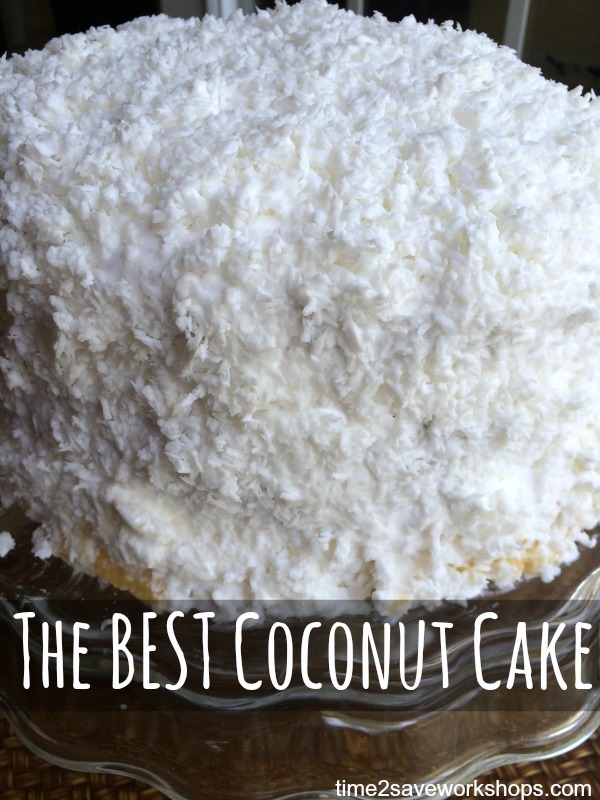 The frozen coconut really makes the cake amazing. It literally tastes like you used a freshly cracked coconut without all the work that would be involved. 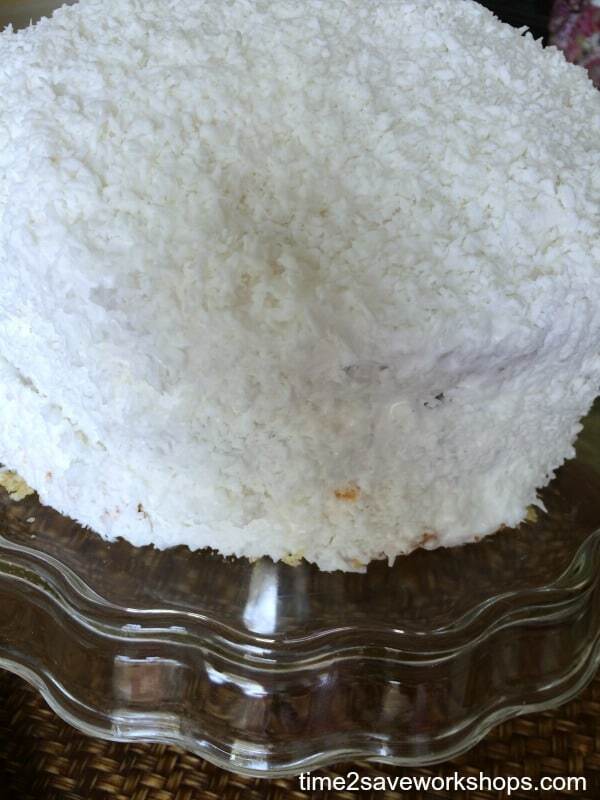 Once the entire cake is covered with the 7 layer frosting add the rest of the coconut to the top of sides of cake. Is it not gorgeous? It’s best to make a day or two in advance because as it sits in the fridge, the sugar syrup mixture and frosting permeates the cake layers and makes it ever so moist and delicious. 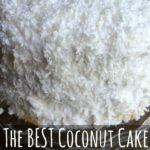 So, what is my secret to the best coconut cake in the entire world? The sugar syrup and frozen coconut make this cake absolutely amazing! **You'll also need at least 3 bags of frozen coconut to add between the layers and top of the cake. You could use packaged coconut but the frozen is the best. Grease and flour (3) 9 inch cake pans. In a large bowl beat butter until fluffy and smooth. Add sugar to butter and beat on low for 6-8 minutes. One at a time add eggs, beating after each addition. Alternate adding flour mixture and milk beating after each addition. You'll want to begin and end with flour. Stir in vanilla until mixed through. Pour equal amounts in pans and level batter. Bake for 25-30 minutes then cool for 5-10 minutes before inverting on a cooling rack. Put all of the ingredients except the vanilla extract in the top of a double broiler. Place pan over boiling water, however do not allow the boiling water to touch the bottom of the pan or the icing could become grainy. Beat for 7 minutes on high speed, then add in vanilla. Boil one cup of water and one cup of sugar until it thickens and becomes syrupy. 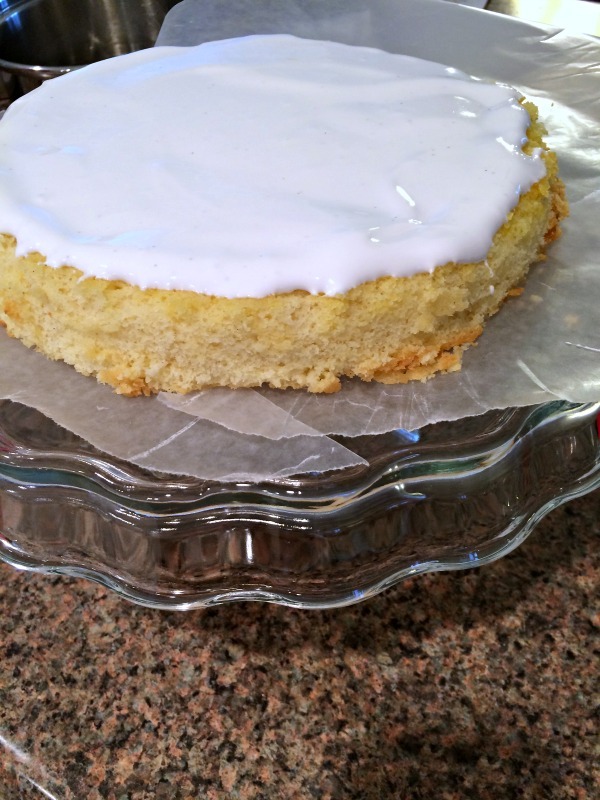 If you like this recipe, check out a couple of other cake recipes. Can this cake be made ahead of time and put in freezer? Also, should frozen coconut be thawed first before adding to cake? Hi! Yes, it can be made in advance and frozen. 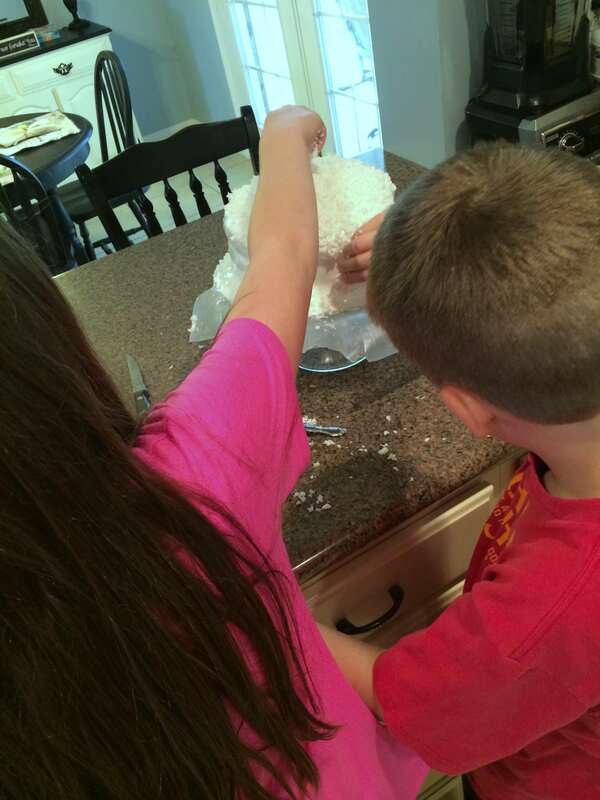 I do pop the coconut in the microwave or lay it out on the counter to thaw it out before putting on the cake. Otherwise, it is hard to spread out. Should butter for cake batter be salted or unsalted? You spoon it on the layers before you ice them to make them more moist. Sure. I’ve only tested as is but I think it should work.